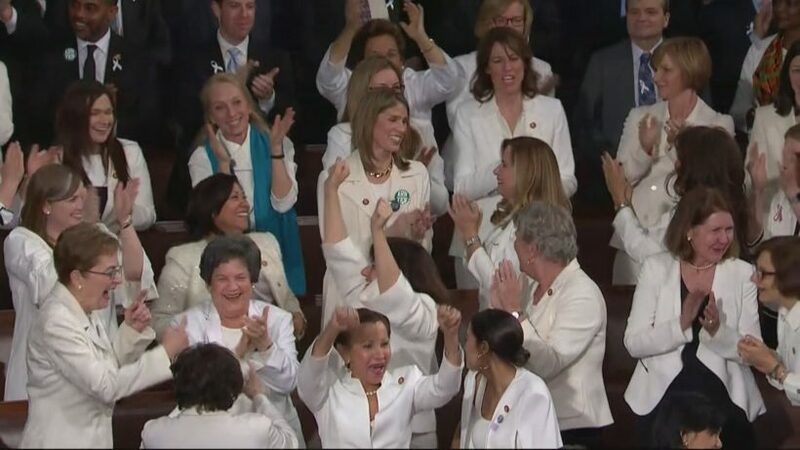 Democratic congresswomen wearing white give themselves and/or President Trump a standing ovation at 2019 SOTU. (by Kayleigh McEnany, Feb. 6, RNC) – President Trump’s State of the Union address Tuesday night once again revealed a clear contrast between radical, left-wing Democrats intent on rejecting compromise and a president offering sensible proposals to benefit the American people. “Victory isn’t winning for our party. Victory is winning for our country,” President Trump said, calling for bipartisanship. The president clearly laid out a vision of compromise, cordiality and working together. He highlighted areas of commonality with Democrats on immigration, infrastructure, and trade – all places where Democrats have expressed support for the president’s policies when those policies were advanced by previous presidents. President Trump’s address was not about politics – it was about doing what’s right to put the American people first. Congressional approval of his proposal would enable him to continue his remarkable record of achievement in the face of unprecedented hostility – and that would be a major victory for all Americans. Unfortunately, Democrats seem determined to make political partisanship and opposition to the president on just about every issue their top priorities. In the past, Democrats supported several of President Trump’s top policy priorities outlined Tuesday night – and often in overwhelming numbers. Today, however, you are hard-pressed to find even a handful of Democrats willing to come to the table and work with the president. Just five years ago, all 54 Senate Democrats voted for “no fewer than 700 miles” of border fencing and voted to end chain migration, end the visa lottery, and spend $46 billion on border security – more than nine times what the president is asking for now. If the elements of this 2013 plan sound familiar, they should. President Trump has asked for these very components in an immigration deal – yet not a single Senate Democrat supports the measure. What changed in five years? The person sitting in the Oval Office. Once content to work with President Obama on securing our border, radical Democrats now sit on the sidelines, determined to deprive the American people of safety and Trump of a political win. President Trump rightfully noted the bipartisan consensus on infrastructure. “Both parties should be able to unite for a great rebuilding of America’s crumbling infrastructure,” he said. In the first year of the Obama presidency, every single Senate Democrat and all but seven House Democrats voted for a $787 billion infrastructure “stimulus” package that failed to stimulate our economy and also failed to rebuild our infrastructure. In the years that followed, “more infrastructure spending” became the rallying cry of Democrats. President Trump, immediately upon taking office, offered an infrastructure plan that was widely rejected by Democrats. For two years, President Trump repeatedly made infrastructure overtures, only to be rejected by the left. Democrats still pay lip service to infrastructure, with House Speaker Nancy Pelosi of California listing it as a point of commonality. But they nevertheless continue to play political games. Most recently, Senate Minority Leader Chuck Schumer, D-N.Y., said that climate change must be tied to any infrastructure deal – a surefire way to raise the bar and complicate any bipartisan effort at change. “To build on our incredible economic success, one priority is paramount: reversing decades of calamitous trade policies,” President Trump said Tuesday night. Like President Trump, Democratic leaders have often criticized President Bill Clinton’s job-hemorrhaging North American Free Trade Agreement (NAFTA). As far back as the 2008 Democratic primary, then-presidential candidates Hillary Clinton and Barack Obama threatened to withdraw from the agreement – a call that many Democrats echoed in the decade to follow. It wasn’t until President Trump that words finally became action. The president successfully exited NAFTA and negotiated the far superior United States-Mexico-Canada Agreement (USMCA). Despite unprecedented labor protections, fairer agricultural provisions, and incentivizing auto production within our borders, House Democrats have indicated they may not support the new agreement. Therein lies the sad truth of Nancy Pelosi’s divided government: so consumed with disdain for the Trump presidency, Democrats have chosen to forgo the needs of the American people. 1. What is the main idea of RNC spokesperson Kayleigh McEnany’s commentary? 2. a) What is your reaction to the points made by Ms. McEnany? — Positive, negative or ambivalent? Explain your answer. Find an article critical of President Trump’s SOTU address. Which commentary do you think more accurately describes the tone and content of the President’s 2019 SOTU? Explain your answer.